Yes, they are bubbles! You get a tube with some gooey substance which you put on the end of a small plastic straw and blow from the other end. After the bubble is made you pinch it off and seal the hole. The bubble remains like that for a few hours and is a great novelty / toy for kids. Thanks to everyone for the comments on the lady's picture yesterday. Excellent capture. Love the reflections. This is fantastic. I would love to have bubble stuff that lasted more than a few seconds. I'll definitely be on the look out for it. Cool shot, love the reflections. This market looks like a great place for finding interesting things to photograph... lucky you! We used to have something like this at fairs when I was a kid too. 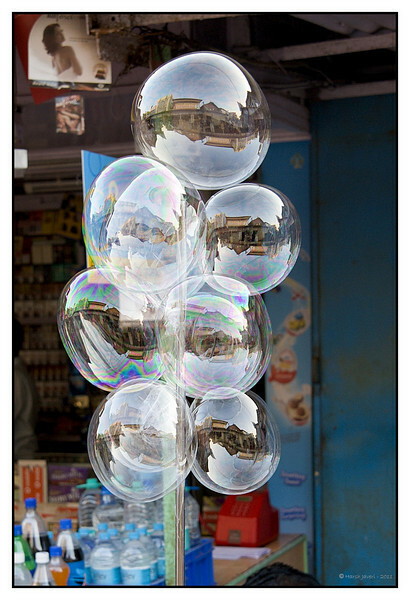 Wow, fantastic refelctions in those bubbles!!! Terrific shot!!! Fantastic Harsh - what a great find, and you have captured it perfectly. I'd rate this one at 10 stars if I could. I love it. I already commented on this, but I'm going to comment again because I just love the outstanding reflections in these bubbles. Be sure to view in 3x. I've gotta try to find some of this bubble stuff.